Miriam (Minnie) Paslay, Eula Deaton, Mazyck Wilson. Since 1889 Mississippi's First Alumnae Association has been providing alumni with a mechanism for supporting their beloved institution. The alumni of the W, affectionately dubbed the "Long Blue Line" by former MUW President Clyda Rent, have always had one of the most active alumni associations in the state of Mississippi. 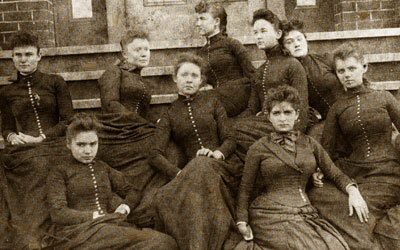 From the very first association president, Fanny Camp Duggar, to today's president, Susan Raynor Puckett, this historic association has been led by women who exemplify the leadership skills they were taught at MUW. They have stood together through the tests of time, the threats of closure, name changes, natural disasters and even U.S. Supreme Court decisions. Through it all, "W" alums have proven that there is no stronger bond than the love and loyalty they hold for their school. In 1971, Mabel Gaston (Class of 1938) began gathering pictures and historical information about the association and its past presidents. Ms. Gaston commented, "The early graduates, like those of today, had a deep-seated loyalty and devotion to their alma mater, which resulted in an organization which following their graduation would help their alma mater in any way possible". In 1925, the new position of Alumnae Secretary was created to help organize the association and publish its news in the Alumnae Quarterly. Prior to this time, the association's publications were produced only sporadically. Helen Perry Hopkins (Class of 1927) served as Alumnae Secretary from 1929-1942. During her tenure, chapters were formed in all 82 counties of Mississippi, and 11 out-of-state chapters were also organized. These chapters helped keep alumnae address information up to date and assisted in recruiting students. Mrs. Hopkins became a well-known ambassador who worked at maintaining good relationships with the administration, faculty, students and leaders throughout the state. "The Persians, we are told, introduced the ring in the wedding ceremony to typify a union that spelled eternity. To me, there is a never-ending circle that links together the college, the students, the alumnae, and the state," said Mrs. Hopkins. "If we could see the force and the beauty that could be made of that circle, there would be no doubt of the place of the Alumnae Association in each of our lives."